Renewable Energies from the Sea: the Future for UK plc? Abstract: This paper reviews the findings of two inquiries into the loss of the fishing vessel, Westhaven. It provides an account of international and UK law, and presents advice to be followed when fishing gear has snagged on a subsea pipeline. Possible arrangements for provision of more detailed information on charts on pipeline burial and freespan status are discussed. Finally the implications of the Westhaven tragedy for pipeline decommissioning and abandonment are examined. Abstract: This paper describes a study carried out to investigate the behaviour of a moored floating production and storage unit (FPSO) subject to wave, current and wind coming from different directions. the main purpose is to investigate a methodology for designing the structure’s mooring system which allows for different environmental phenomena to come from different directions and to peak at different times. Some results are presented to illustrate the effects of directionality and non–concurrency for the particular ship data assumed. Abstract: In order to determine the impacts from drilling operations, it is necessary to understand the physical dispersion of the drilling discharge into the sea. The development of a waste dispersion model enables the prediction of the concentrations of drill–cuttings deposited on the seabed and the thickness of the cuttings pile (if present) on the seafloor. Some models already exist and could easily be improved by using more appropriate equations for the settling speed of cuttings in the water. In this paper, an existing simulation model is presented with its required input data and obtained output data. Four different settling speeds equations are introduced in the described model to compare with the usually used equation. Graphical data are produced and discussed for each test. It was found that the settling speed equation chosen for a dispersion has a significant influence on the final output data. Another common problem also comes from the nature of the input data required from the user. These input requirements are not always in agreement with what the oil companies can provide. Correlations between data needed for the simulation and data provided from oil companies could be determined through experiments. A set of experiments is proposed in the last section of this paper. Abstract: This paper reviews how many pelagic organisms maintain their buoyancy in the ocean. Although there are thousands of different species of marine organisms, ranging in size from microscopic plankton to squid, shark and the large whales, the mechanisms they use to avoid sinking are not as varied. These mechanisms include: the exclusion of heavy ions to create a less dense liquid; enlarging the surface area of the organism to increase drag; the use of gas chambers; the use of low–density waxes and oils, and hydrodynamic planes. Natural buoyancy systems are compared with those currently used in various underwater vehicles; in addition, the attempts being made to mimic the mechanisms present in nature are described. Abstract: Continuous measurements of electric potentials were taken from a fixed point at the entrance to Southampton Water, adjacent to the Solent. This provided a regular and wide spectrum of electric field sources for study. Southampton Water has a considerable movement of vessel traffic entering and leaving the Port of Southampton, and a significant tidal movement each day. Underwater electric fields were measured adjacent to a shipping channel of approximately 7 m depth. Analysis of signals allowed various signatures and sources of electrical noise to be identified. Regular ferry traffic allows the reproducibility of the sensor response to be examined. This permits background sources of noise to be better identified and therefore increases the ability to discriminate the various signals of interest. 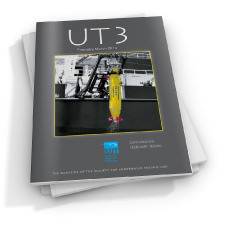 Abstract: Commercial, naval and scientific operational specifications for uninhabited underwater vehicles (UUVs) continue to become more challenging in line with the advances being made in control engineering. In order to survive actuator and/or sensor failure during a mission, such vehicles need to possess a reconfigurable or fault tolerant control system. This paper explains the basic principles of fault tolerant control systems. It then reviews their application in the design of UUVs and other systems where it is considered a technology transfer is possible. 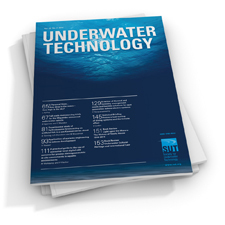 Abstract: The use of remotely operation vehicles (ROVs) by ocean scientists has increased significantly during the last decade. 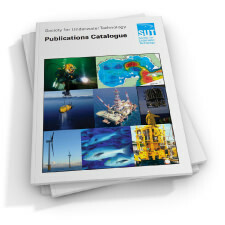 Of particular value and interest is the acquisition and analysis of subsea video images to obtain accurate measurements of seabed features, biota and manmade artefacts. Video images obtained by ROVs have a variable perspective and scale but this problem may be solved by the use of structured lighting comprising an array of diode lasers. A DOE Phantom XTL TOV has been fitted with a 5–spots diode laser system Abiss, and has been deployed in research programmes in Plymouth Sound and the River Dart. An important aspect of these programmes is the development and perfection of verifiable measurement and sampling techniques, which may then be employed with confidence in inaccessible and hostile waters. Abstract: Acoustic beacons transmitting certain sound patterns underwater are known to have a deterrent effect on harbour porpoises and are a promising means of keeping these animals away from fishing nets. The device described here has been successfully tested during sea trials in Scotland and Denmark and has been shown to reduce the by–catch of porpoises during a commercial fishing trial. Introduction: In this paper the value of archaeology is discussed and its development in Britain outlined. The contrasting development of archaeology both underwater and on land is examined to assess their relative positions in the profession. Both terrestrial and maritime archaeology have undergone significant changes in structure over recent years, a review will given an insight into the status of archaeology today. 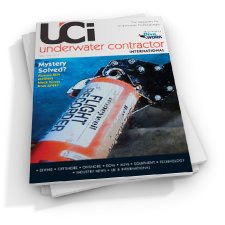 Abstract: This paper describes the development and application of an integrated tooling/NDT system which provides the potential to undertake a weld inspection, carry out removal of the defective zone, and achieve validation of the repair, all within a single ROV deployment operation. Removal of the defect zone is achieved using a novel application of the electrochemical machining process (ECM). This system is integrated with the alternating current field measurement (ACFM) system, for crack detection, location and sizing. The paper describes the development of electrochemical machining process models to cover situations encountered in automated weld sampling operations. From these models, and data collected from experimental trials, it has been determined that the sampling/removal operation can be carried out at tool feed rates of up to 3 mm/min. The model has been extended for determining the change in gap dimensions for the case of zero tool feed. This relationship can be used as a control parameter when determining the degree of overcut required when inclusions are encountered and the tool is required to remain stationary for a certain duration. Tank trials of the system have been carried out, successfully demonstrating effective operation of the integrated strategy in a submersed environment. 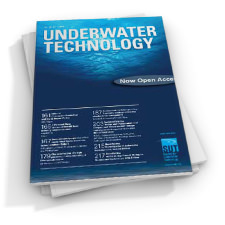 Abstract: This paper addresses the problem of the guidance of unmanned under3water vehicles (UUVs). In the framework of a two–layered hierarchical architecture uncoupling the system’s dynamics and kinematics, a couple of guidance laws for approaching a target with the desired orientation and following an environmental feature have been designed with Lyapunov–based techniques. Suitable acoustic–based estimators of the corresponding operational variables have been designed and integrated with the guidance and control system. Experimental results of pool trials of a prototype UUV executing free–space manoeuvring and wall–following tasks are reported and discussed. Abstract: This paper presents the results from statistical analyses of wave and wind data collected over a period from August 1994 to June 1998 at the North Alwyn, fixed, oil and gas platform in the northern North Sea. Theoretical joint probability distributions of individual waveheight and periods are found to provide a poor fit to data sets obtained by aggregating the individual waves into bins defined by the significant waveheight. Hs, and average zero–crossing period, Tz, of the 20–minute interval in which the waves were observed. Better fits are obtained when empirical models are used for the join probability of individual waveheight and steepness, and a general bivariate Weibull model is presented that is conditional upon significant waveheight and average zero crossing period. The JONSWAP spectrum peak enhancement parameter g is found to vary significantly for the storm seastates examined.